Well I have made a card after weeks of not doing one. My mother-in-law wanted a golden wedding anniversary for her relatives in Canada. The decoupage and backing paper comes from the party paws cd rom. The gems and ribbon is from my old stash and I used collal all purpose glue and collal tacky glue. 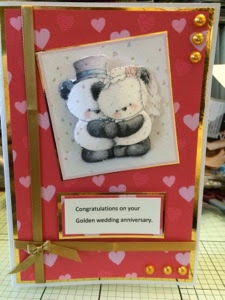 Fabulous card, love the cute wedding couple image. Love that cute image - great card - they will love it! !